The Mason Group has been a very proud supporter of Colon Cancer Canada over the past number of years. 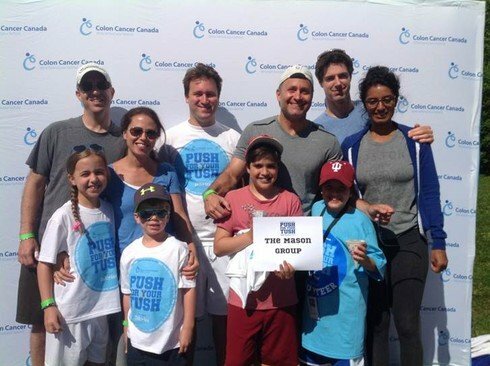 On Sunday, June 1, 2014, Team Mason Group put forth another solid fund raising campaign raising almost $5,000 for Colon Cancer Canada, bringing our cumulative fundraising efforts to over $25,000 for this very worthwhile cause. Colon Cancer Canada (CCC) is a national organization dedicated to saving lives through increasing public awareness of colorectal cancer and access to screening, funding research initiatives, and providing colorectal cancer patient support. Since 1996, CCC has provided much-needed funds for colorectal cancer research, awareness and patient support. When CCC began, they started with a very small but dedicated group of volunteers. Thanks to caring and generous supporters, the organization is now made up of hundreds of dedicated doctors, researchers, patients, families, and fantastic volunteers. Through hard work and dedication, CCC has raised over $7 million to-date. CCC has disbursed grant money to hospitals that include Sunnybrook Health Sciences & Women’s College, Mount Sinai Hospital, Princess Margaret Hospital, St. Michael’s Hospital and S.M.D. Jewish General Hospital in Montreal. All the grants benefit colorectal cancer research at these institutions by financing state of the art equipment and technology and establishing fellowships.